It's a simple feather and fan with garter stitch border done in a cheapo acrylic yarn. It was one of the first "bigger" projects I made after learning to knit. I would never knit this today. I would use nicer yarn or a more complex pattern, I'm sure. You know what, though? We use this little blanket quite a bit. It gets placed over the baby in the swing when the a/c is a bit much. It gets thrown over the carseat bucket when it's raining. It is soft, washes right in the washing machine and snuggled while nursing. Yay for simple, first knits! There will be lots of plain white Kona cotton fabric in there as well. 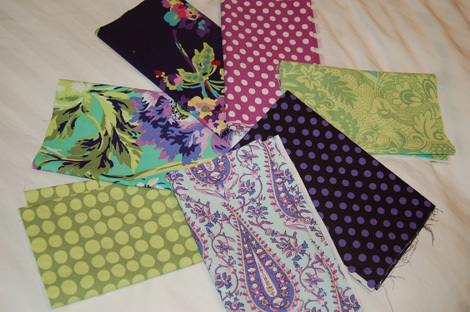 I love this new shop because it has a lot of modern fabrics in amazing colors and prints. This weeks homework is to wash and press our fabric and gather all of our supplies. I'll keep you posted on my progress! Do I spy some Amy Butler's "Love" fabric in there?? You picked out a wonderful combo - can't wait to see how it turns out! Love the baby blanket, too. Ooh! I love your fabric choices! These are not "safe" fabrics - they're not all in the same color family or from the same line or all florals (etc.) You've done some real mixing and matching, and this is a FUN combination! I think that a quilt with a variety of scales is a good thing, because it doesn't bore the eye. I'm guessing that you chose the black floral first and looked for fabrics that would play off that one? Yummy!! I also like the baby blanket. It's a pretty pattern, and you made it in a practical yarn. Fun! I still hang onto some of the acrylic yarn that I bought when I first started knitting. I probably won't ever use it, but it reminds me of those early knitting days. Might be "cheapo acrylic yarn", but the blanket is knitted so beautifully. And I think the ones out of cheap yarns get used the most, because we aren't afraid to "mess" them up. Ooh, I love the quilt fabrics! Where are you taking the class? And I love the knitted blanket. 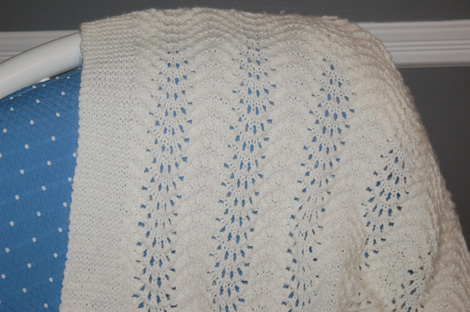 One of my first projects was a rectangular baby blanket crocheted out of cheapo baby acrylic in stripes; but my cousin said her baby loved it. Ooh, quilting! I haven't been bitten by that bug just yet, but my friend who taught me to knit has. Maybe someday I'll try to add on that hobby too. Best of luck! Ooooo --- love those fabric colors. So many quilt fabrics are "cutesy". These are much more sophisticated. I'm sure Baby Starfish #2 loves his blankie. It's beautiful. I love the blanket. Sometimes, just simple and functional wins! I can't wait to see your quilting progress. I love the blanket. I remember making one very similar when I was expecting my first child and it lasted through all four of mine. It is beautiful. I hope to catch up with you on Ravelry. I just made a feather and fan dishcloth! I'm working on a baby blanket for my friend in the feather and fan pattern, also out of cheap-o acrylic, just because I can't afford enough merino to make something of that size. This page contains a single entry from the blog posted on May 6, 2010 6:24 PM. The next post in this blog is Little Bit of Everything.